Debbie Cairo lives in Evanston a suburb of Chicago with her two dogs Spike and Freddie. 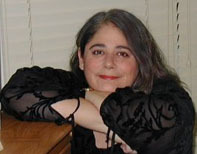 She is the founding member of the Evanston Writer’s Workshop which currently has almost 400 members. Debbie has been writing for 10 years and and her first novel Over My Undead Body was pubished in 2009 by Whispers Publishing. When Debbie is not writing, she is employed in the technology field. As well as her programming work with a number of companies, she also designs and builds websites for many writers. Born and raised in the Second City, she loves everything it has to offer from comedy and theater to new and exciting restaurants.